About-Jesus.org have created a number of Google Maps mashups related to the life and teachings of Jesus. Map of Jesus's ministry - Shows many of the cities within the land of Israel that are mentioned in the New Testament, or were important during New Testament times, about 2000 years ago. Map of the cities with the seven churches in Revelation - Shows the seven Turkish cities that have the churches that are referred to in the Bible's book of Revelation. For example, when you choose the Old Testament, book of Exodus, chapter 17, you learn more about the city of Rephidim and what it was significant for with supporting detail after clicking on its name. It will also tell you how many times this name appears in the bible. This is a great way to take geographic references and put them together with text, creating a mashup on so many levels! The creators of the site have this to say: "..The motivation for developing the site was simple. 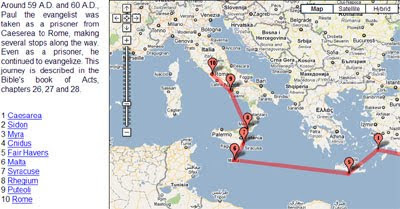 Create a free Bible atlas which harnesses Google Maps. We hope this site will be a blessing to you and possibly help make the living book of the Bible more alive in your life." If you centre Google Maps on Jerusalem and search 'user-created' maps you can find many My Maps that highlight locations with a Christian significance.